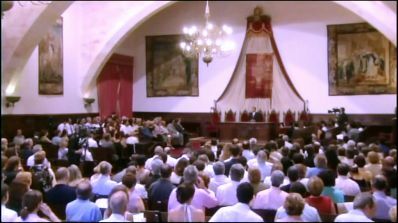 Maharaji delivered the keynote address at the first conference on peace "Peace is Possible", at this 13th century University near Madrid, Spain. Maharaji spoke in the great hall, "Paraninfo". He was introduced by the Vice-Rector, who hailed his message as "Noble". The University of Salamanca is the oldest university in Spain; founded in 1218 by King Alfonso IX. Many well known citizens have walked through the corridors of the university, including Christopher Columbus. Following is a brief excerpt from an address by Prem Rawat at the University of Salamanca, Salamanca, Spain. It’s an honor to be here to talk about a very simple subject—peace. There are a lot of ideas about peace and I’m not here to add more, but to present a very simple possibility. When are we going to acknowledge the peace that we need in our lives? When are we going to take the first steps to fulfill the oldest dream that mankind has had? Peace is a fundamental desire of every human being. It needs acknowledgment, and it needs to be realized, fulfilled. We need to turn within ourselves to find the answers for peace. We’re not going to find them outside. They are written in the very the pages that reside in the heart of every single human being regardless of who they are, what their belief is, or what they have done. I have a dream that all civilizations, all people will be in peace. People say to me, “Isn’t that an impossible ideal?” Then I say to myself, “If that is true, then it is the only ideal worth having. That is something I can try to help with.” And that’s what I do. The amazing thing is, that to have peace on the outside, you have to have peace on the inside. This is not new. Everyone knows this. And to find peace on the inside is the most simple process of all because it is already there. It does not have to be created. It is there to discover, to have, to enjoy. The thirst for peace lies within all of us. Around the world, I have found the currency not to be common, language not to be common, clothing not to be common, food not to be common. But the desire to be fulfilled is common to everyone. That’s what I am addressing. I travel around the world bringing this message to people, and I hope people listen to it, that they get something out of it. I’m not preaching, nor am I teaching. All I’m doing is presenting a possibility. Peace is important to me, and I hope that peace is important to you. Because, after all, when I look at the horizon, if I have to imagine the world without peace, it is, indeed, a very grim prospect. When I see the light on the horizon, I certainly hope it is the light of the peace that dances, waiting to shine in my life, in my time.